At the height of Jerry Springer's popularity, he was involved with a movie based on his own experiences as a talk show host. 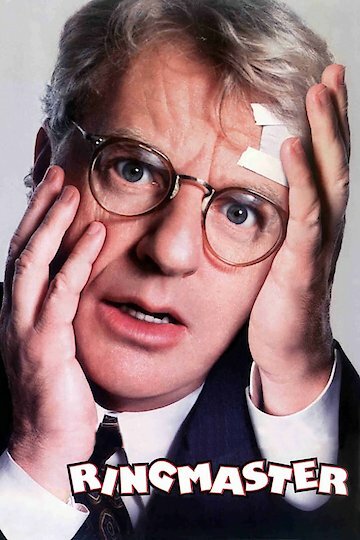 Ringmaster stars Jerry Springer as the lead character, a man named Jerry Farrelly, who hosts a talk show quite similar to the show that Springer himself has hosted for years. The show is simply called "Jerry" and contains all of Jerry Springer's usual fare. There is no shortage of cheating spouses, transsexuals, and sexually uninhibited people who come directly from trailer parks. The characters in Ringmaster are every bit as controversial and disturbed as one would expect. Characters include a woman who is in a sexual one-upmanship contest with her own daughter. The woman's daughter slept with her husband, so she slept with her daughter's boyfriend as a form of trailer park revenge. Another guest, a woman whose boyfriend has slept with all of her friends, brings her boyfriend to the show to confront him. The guests on Jerry Farrelly's show are not dissimilar from Jerry Springer's general fare. The fictional show's guests grow increasingly violent, arguments escalate, and many of the characters become sexually (or otherwise) involved with one another. The woman whose daughter is sleeping with her new husband, and the daughter herself, even make a pass at Jerry. This causes even more drama and violence, not unlike Jerry Springer's own show. The movie culminates in an episode of Jerry Farrelly's talk show with the show's guests arriving and creating all kinds of trouble. There are transsexuals, knockdown drag-out fights amongst guests, and Jerry enjoying every minute of it. Those who enjoy Jerry Springer's currently running talk show have no reason to not enjoy the movie Ringmaster. All of Springer's usual fare is available, though slightly exaggerated. It may be fictional, but Ringmaster manages to hit most points of Jerry Springer's actual talk show quite well. Ringmaster is currently available to watch free on Tubi TV and stream, download, buy on demand at Amazon Prime, Amazon, Vudu, iTunes online.